EZRA CHARLES is now performing as a two-man band with his favorite drummer, Jake Helpinstill. Together they are "Keyz & Stix," and will be appearing in venues all over Texas. 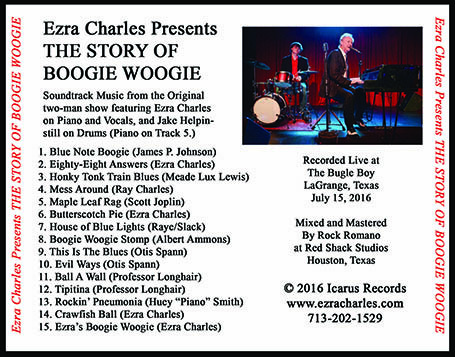 In addition to regular club shows, they have developed a new dedicated presentation that illustrates his achievements over the years as a songwriter, creating the material that made Ezra Charles and the Works one of Texas' biggest bands. Fans of his last production, “The Story of Boogie Woogie,” will be delighted by this all-new show with similar entertainment value and musical intensity. A night of storytelling and music, Ezra performs much of his well-known repertoire, and precedes the songs with interesting details of their inspiration in his own unique, amusing style. Look for this show to appear soon in the same venues as "The Story of Boogie Woogie." 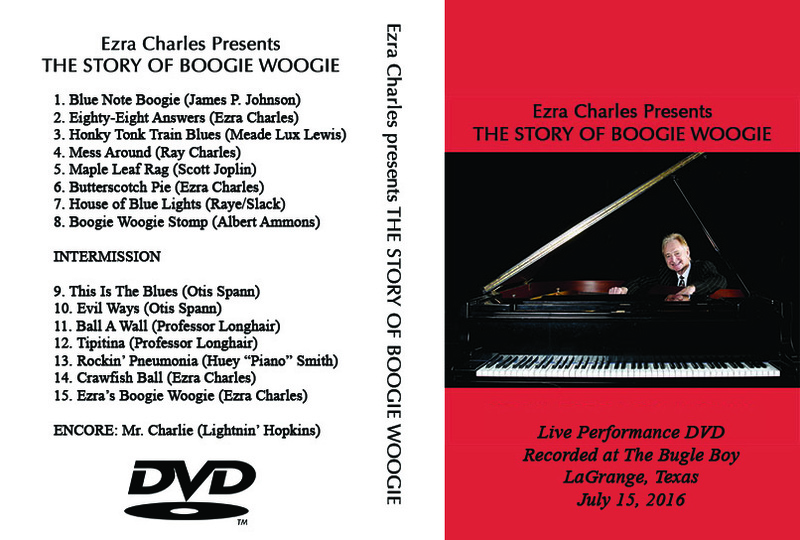 If you missed the performances of "The Story of Boogie Woogie" you now have the option of buying a DVD of the show! This DVD conains the entire performance of the show as performed during 2015 and 2016, including all of Ezra's informative and humorous narrations. 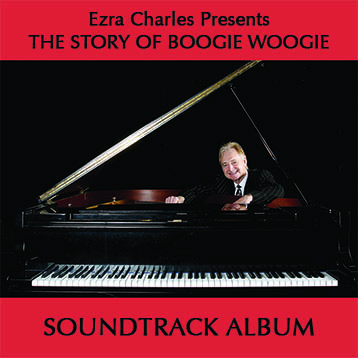 The CD "Soundtrack to The Story of Boogie Woogie" is also available. It contains 15 tracks - all the songs played during the show. If you can't wait to buy these at a performance, you can call with a credit card number (713-202-1529). The DVD is $30, and the CD $20 - no tax, and we pay shipping.